This value-priced boxed set features 8 country-set romances starring ever-popular cowboy heroes. A little down-home charm and a pickup truck are all these country boys need to capture your heart. 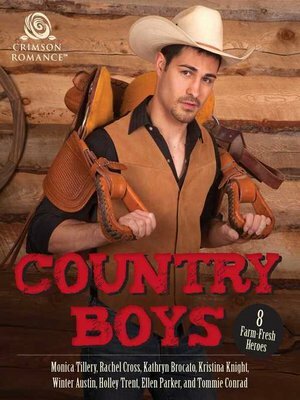 Wrangle this bundle of eight cowboy romances for an amazingly affordable price. Adam's Ambition: Adam Whitman left Emerald Springs long ago and has forged a career for himself out of the family's shadow. But when his father calls him home to the family tea farm, he gets a second chance at romance with Zoe Miller, the love he left behind and couldn't forget. Bloom: When L.A.'s charity fundraising maven Ava Bennett heads out to the middle of nowhere to check on a friend for her rock star client, she never expects to tangle with infamous music producer turned organic farmer Nate Robinson, nor endanger his dog's health. Can a career woman find love with a virtual hermit? Old Christmas: When professional chef Casey Gray returns to the southeast Texas farming town where she grew up, she doesn't expect to feel anything for her former lover, Kalin McBride. It will take every bit of determination Kalin has, plus a little help from the magical spirit of the holiday, to convince Casey that her future lies with him. Relentless: Battling both his partner and the demons of his past, Dallas Detective Remy LeBeau will do whatever it takes to catch a serial killer. But when it's professional barrel racer and country girl Cody Lewis in the killer's crosshairs, his best may not be enough to save her and their love. The Cougar's Bargain: Hannah Welch doomed cougar shifter Sean Foye to spend the rest of his life in his animal form when she refused to accept him as a mate. But an attack at the Foyes' New Mexico ranch ended with Hannah becoming a cougar, too. She strikes a bargain with the goddess who cursed him: Sean will be freed from his furry affliction if Hannah can find him a more suitable mate. But will she be able to give him up? Heart Trouble: Life comes easy to rancher Brandt Connor, until he falls for Marissa Sloan, who's leaving home at summer's end. Will Brandt let her go or put aside his free-wheeling reputation to become the man he's meant to be?